Back in the day, a pair of sneakers promised to help you run faster and jump higher. Now, the shoes — at least their brand — are also expected to make money for you, too. In the last three years, Adidas (OTCMKTS:ADDYY) has done that bit the best, as ADDYY stock has been the only one of its peers to outperform the market in that time. The athletic shoe and apparel space has four big publicly traded companies: Adidas, Nike (NYSE:NKE), Under Armour (NYSE:UAA), and Skechers (NYSE:SKX). In that three period — and despite secular tailwinds in athletic apparel adoption — shares of Skechers and Under Armour have fallen by 25% or more. Nike’s under-performed the market with a mere 15% gain. The S&P 500 index has risen 20%. Meanwhile, Adidas stock has more than doubled. But, history is no accurate indicator of the future. Unfortunately, when it comes to Adidas stock, the success over the past three years will not repeat itself over the next three. The retro trend that’s made Adidas the hottest brand in athletic apparel has come and gone. Now, the three-stripe brand is rapidly losing steam amid rising competition primarily from Nike and Lululemon (NASDAQ:LULU). Usually, these trends take several years to play out, and this one is still in its first year. As such, Adidas stock — which has plateaued over the past year as the brand has lost steam — looks due to be stuck in neutral for a lot longer. Throughout 2015, 2016, and the early part of 2017, Adidas relished unmatched brand popularity in the athletic apparel space. A return to retro styles kick-started the Adidas resurgence in 2015. Then, Adidas poured money into footwear innovation and leveraged celebrity endorsements to pivot into a lifestyle brand. That only enhanced the company’s already-climbing popularity. As a result, Adidas stole tons of mind and market share from Nike. But then the sleeping giant from Oregon woke up. Nike realized that their product innovation lagged its German competitor, and that they were falling behind on the lifestyle front. So, in mid-2017, Nike launched its Consumer Direct Offense initiative, turning the swoosh into a lifestyle brand with more rapid product innovation and a direct sales approach. The result? Nike’s turned around North American sales with that business now growing at a multi-year high pace. Of course, Nike punching back means Adidas has lost steam. Two years ago, Adidas revenue rose 18%. Last year, the increase was 16%. Last quarter, the growth halved to 8%. That is a bearish slowing growth trend. But, it runs deeper than slowing revenue growth. Take a look at Google search interest trends for Adidas both globally and in the U.S. They peaked last year. This year has marked a sharp downturn. That’s not good. As seen in the attached chart, search interest trends have coincided with Adidas stock. Huge search interest growth in 2015-16 coincided with a run-up in Adidas stock, while falling search interest growth has tracked ADDYY stock falling flat in 2017-2018. Now, search interest growth is actually turning sharply negative for the first time in five years. That can only mean bad things for Adidas stock ahead. At current levels, Adidas stock isn’t priced for the brand to keep losing steam. Instead, it is still priced for the brand to gain momentum. The current forward earnings multiple is above 20x. That’s about 10% higher than the five=year average forward multiple of 18x, and also about 30% higher than the apparel retail average forward earnings multiple of 15x. The price-to-book multiple is also above its five-year average, while the dividend yield is below its five-year average. Simply put, Adidas stock is still more expensive than normal. That doesn’t make sense. Recession risks loom on the horizon. Growth is slowing. The brand is rapidly losing steam. The trend is all about Nike and Lululemon now. In other words, the appropriate valuation for ADDYY stock — at best — is a historically average valuation. That implies that shares are about 10% overvalued today. So long as the Adidas brand continues to lose steam, ADDYY stock will struggle to head higher. The time to buy ADDYY stock has come and gone. Now, it’s time to buy NKE stock and LULU stock, and forget about Adidas. Until the trend changes course and Adidas reinvigorates growth, Adidas stock will be stuck in neutral. As of this writing, Luke Lango was long NKE, SKX, UAA, and LULU. 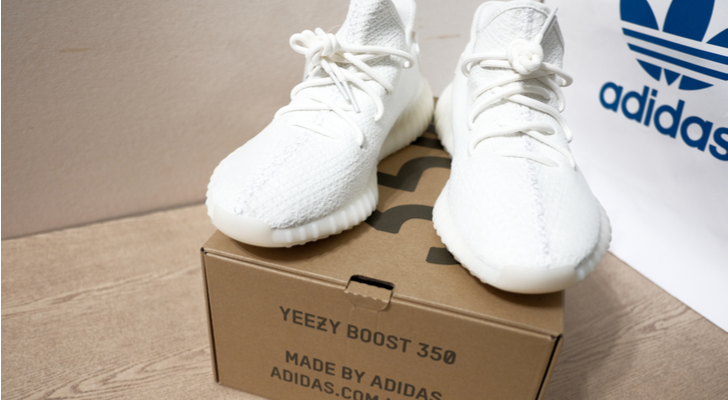 Article printed from InvestorPlace Media, https://investorplace.com/2018/12/adidas-stock-is-a-sell-because-the-iconic-brand-is-losing-steam/.